Read about how Bill and I first met, and the courtship before he agreed to collaborate on the book. Bill and I posing after a 2011 interview session at a restaurant in Saratoga Springs, NY. We sometimes met at Bill's home in the small, upstate city known for its horse racing, but through late 2014, the Q&As also occurred in locales as disparate as Florida and New Jersey. 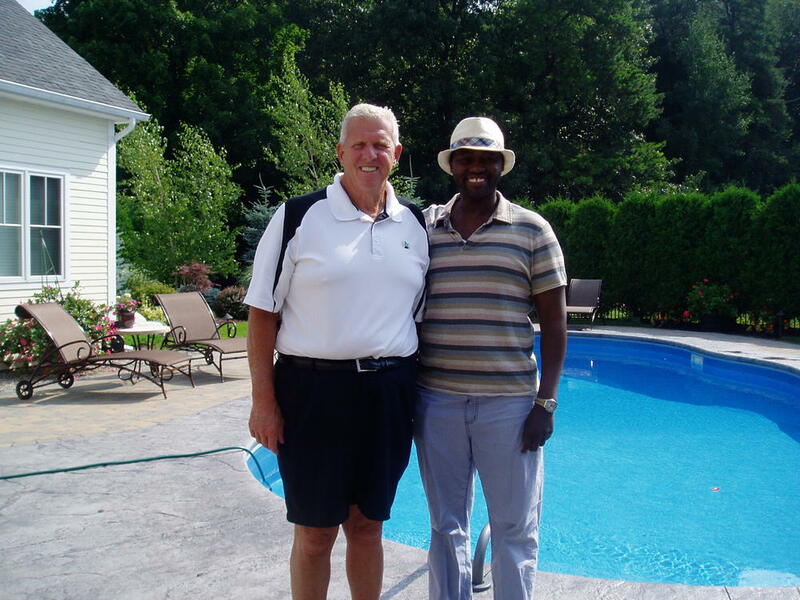 The modern history of the NFL can’t be told without Bill Parcells as a central character. From the early 1980s through the twenty-first century, Bill transformed multiple teams, lifting them to new heights and gaining entrance into the Pro Football Hall of Fame in 2013. The former leader of the Giants, Patriots, Jets, Cowboys and Dolphins left an indelible mark on the game, producing a Sequoia-like coaching tree that features winners of six Super Bowls and counting: Bill Belichick (four), Tom Coughlin (two), Sean Payton (one). As an architect of the game, Coach also tutored numerous scouts including Trent Baalke, the 49ers's personnel chief. One of the top motivators, and quoted figures, in NFL annals, Bill galvanized all-time greats like Lawrence Taylor, Curtis Martin, DeMarcus Ware and Jason Witten. I felt a tad nervous meeting the Big Tuna for the first time in September 2006 while on an assignment for Sports Illustrated: spotlighting Parcells's Cowboys in a piece about the NFL's trend of two athletic tight ends in base offenses. My jitters didn’t stem from sitting in the legendary coach's office in Irving, Texas for a one-on-one. Gigs with the New York Times, New York Daily News, Seattle Times and Washington Post had enabled me to spend quality time with a range of mainly sports luminaries including R. Kelly, Gary Payton, Joe Gibbs and Sean Taylor. Besides, I'd sort of interviewed Bill once on August 4, 1997 as part of a media group while filling in for the Daily News's Jets beatwriter. But for my 2006 sit-down, Rich Dalrymple, the Cowboys P.R. director, had allotted only ten minutes. And Bill spent the first five of them grilling me with questions like: Where did I attend college. (St. John's University.) How long have I been at SI? (Less than a year.) What neighborhood in Manhattan do I live in? (The Upper West Side.) Bill joked that the magazine must be paying me a king's ransom. Given Bill's policy against one-on-ones, I’d been lucky to finagle even a small window: He'd made me an exception, perhaps because he welcomed interest from the national media about football strategy versus its obsession with his controversial wideout, Terrell Owens. Bill ended up giving me a half hour, enthusiastically answering all my questions in his booming voice. The next day, I surmised his Cowboys-issued email address and emailed him: Thanking Bill for his time, I confirmed that my article would appear in SI's Sept. 25 issue. To my delight, Bill replied back with a message saying that that he looked forward to reading the story. On Monday, January 23, 2007, three weeks after the season ended, Bill made national news by quitting the Cowboys. I tried my luck again, emailing him to wish him well in retirement. Bill's reply, amid all the attention over his decision, shocked me: he volunteered his cell number, and told me to call him anytime! The irascible football guru, known for shielding himself from the media, had given me an open invitation to contact him directly. The development coincided with my imminent departure from SI, and plans to write a book. So although I'd been exploring a couple subjects, one of the most fascinating coaches in sports history jumped atop my list. I wasted little time telephoning Bill at his winter home in Jupiter, FL. But he responded to my idea with a laugh. Coach pointed out that he'd done multiple books, and declared: "I'm old news.” Bill advised me to pursue a "hot young coach like Eric Mangini," who had just guided the Jets to a surprising playoff appearance during his rookie season. But I explained to Bill that after more than a dozen years writing for newspapers and magazines, I wanted to pen a definitive book on a compelling subject who'd lived a full life. I stressed that it would be unlike his others, which I candidly described as failing to do him justice. Instead, this book would be comprehensive, chronicling his life story as a prism into the NFL, America's most popular sport. I likened the idea to a modern-day version of David Maraniss's Lombardi classic, yet Bill's peripatetic career would allow us to traverse football history over a half-century, showing the game's evolution while including mini-portraitures of key characters like Bill Belichick, Woody Hayes, Bucko Kilroy, Curtis Martin, L.T. Although books of that scope required several years to complete, I planned to obtain funding from close friends while interviewing Bill at his convenience. I wouldn't bother him for months at a time as I interviewed dozens upon dozens of others. Despite his dismissive reaction, Bill never quite said “no" after hearing some detail. While maintaining disinterest, he obliged my request to think about it before giving me an official answer. With those flickering hopes in late February 2007, I sent Bill an unofficial proposal and a package of my favorite articles spanning my career. The clips included a New York Times feature on Stephon Marbury in 1994 when he was a high-school prodigy, and an SI cover story on Troy Polamalu in November 14, 2005. In the letter accompanying those articles, I bragged that I had won some national writing awards. I didn't want Bill to rule me out just because I had never written a book. He complimented me on the "interesting stuff." Despite remaining neutral if not lukewarm about the idea, Bill avoided making a decision. On February 26, 2007, he emailed me: "Stay in touch, and maybe in a few months we will revisit. Good Luck. Bill P."
Instead of hounding Bill on the phone, I sent occasional emails. But winter turned to spring, and then summer as my savings dwindled. I decided to send Bill a 20-page summary of my mother's life. In a letter with the material, I told Bill that it would help him get to know me better. Dorcas Demasio had moved from Ghana to Harlem, USA in 1975, with five kids, splitting from her husband, a diplomat. She worked day and night while putting all her children, including three boys, through college. She'd also obtained a Master's degree in Nutrition from Columbia University. My letter to Bill indicated that I needed to move forward with his book -- or someone else's. A few days later, Bill sent one of his succinct, staccato-like emails: "Got stuff. Read it all. Quite a life. Will talk soon. Bill P." The next time we spoke, Bill remarked that I should be writing her story instead of his, but invited me to his home in Saratoga Springs. Bill described the city as a "neat place with lots to do." Exciting!!! At Bill's backyard in Saratoga Springs early in the project. I never got to take a dip in his heated pool, but the location was a great spot for a couple of the Q&As. In late July, 2007, I checked into a hotel in downtown Saratoga Springs. The next morning, Bill picked me up in a black Cadillac. Coach said that he had done some homework on me. Although he declined to give details, I viewed his research to be a good indication. He soon gave me a tour of his home -- another promising sign. Then we patronized one of his favorite restaurants, where I got down to business: I told Bill that if he cooperated, I would try to put together an all-star team of seasoned folks to help me execute my vision. A handful of top agents were interested in representing the book. But I intended to avoid signing with anyone for at least a few years while maximizing leverage with strong material. To focus on the project, I would forgo all employment opportunities. When the waitress came to check on us, Bill told her that I was crazy. We all laughed. Nonetheless, his next few remarks showed that he'd become intrigued with the supposed nuttiness. Bill said that he didn’t want to cooperate in a book project that would hurt his ex-wife or three daughters. That wouldn't be an issue, I responded, but I told him that he shouldn’t go forward unless he was willing to be part of a nuanced book. I wanted to capture the man behind the icon, and needed to interview his detractors for balance. So I stressed that he wouldn't like everything in the book. Regardless, Bill finally seemed sold. But he had a quirky requirement: no curses in the book partly because his daughters would read it. For the material to be as authentic as possible, I urged a compromise. We would stay away from f-bombs while using other expletives without being gratuitous.